All nature lovers can purchase a membership card. This card allows you to save on access charges to the site, but also on the launching of small boats. In addition, you will receive a free digital copy of the magazine Bois d’enfer, offering news and activities about the reserve, three times a year. Membership allows you to participate in annual general meetings and to commit to this organization by voting. Click the button below to proceed to the annual payment of Membership Card. You will be redirected to a secure PayPal payment access. 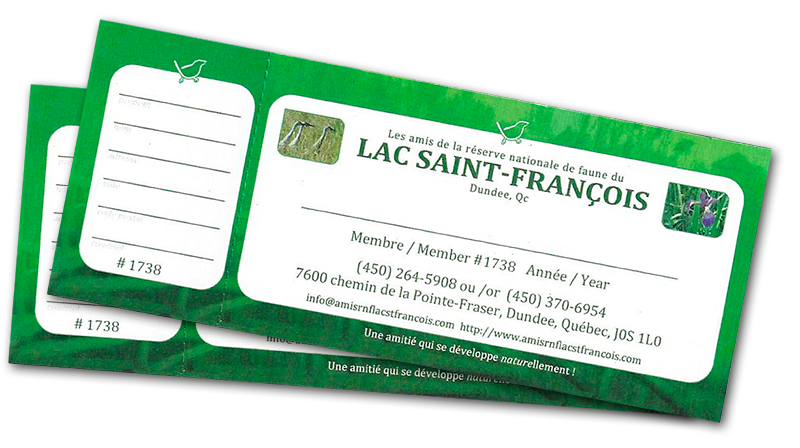 If you, like us, have at heart the protection of this area, you can act and make a donation to Les Amis de la Réserve nationale de faune du lac Saint-François. Click the button below to proceed to the annual payment of Membership Card. For any amount over $ 20, you will receive a receipt for tax purposes.